Mommy, can we go home now? 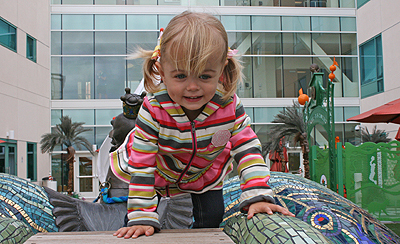 Those are the heartbreaking words from 2-year-old Avery shortly after her latest surgery. This tiny girl has endured more in just two years of life than most of us will in a lifetime. Yet Avery radiates sunshine everywhere she goes. Her happy demeanor and angelic like laugh always lightens the room, no matter what Avery seems to face, including a host of complications and two major cranial surgeries in just two years. Before Avery was even born, doctors diagnosed a serious problem. Sheila, Avery’s mom, was only 27 weeks pregnant when a prenatal checkup revealed that Avery had supraventricular tachycardia (SVT), a disorder that caused her heart to beat faster than normal. To carefully monitor Avery’s heart, Sheila was hospitalized three times while pregnant and put on medication. Avery’s birth was an incredibly happy day for Sheila and her husband, but they would soon find out there would be many frightening obstacles for Avery that lay ahead. Shortly after Avery was born, Sheila noticed her baby’s right eye seemed to bulge out. Sheila knew something was terribly wrong and a CT scan confirmed her fears. Avery was diagnosed with craniosynostosis – a cranial deformity that would mean Avery would face major surgery not once, but twice to ensure her brain could properly grow. “We were so happy to hear it was fixable, but the surgery was so drastic,” says Sheila. Can you imagine, at just 6 months old and then again at 2 years of age, Avery would need a craniotomy – a delicate procedure that involved reconstructing Avery’s tiny skull. Thankfully our surgeons Dr. Steven Cohen, Chief of Craniofacial Surgical Services, Dr. Hal Meltzer, Chief of Pediatric Neurosurgery, and Dr. Don Kikkawa, Division Chief of Ophthalmic Plastic and Reconstructive Surgery, knew exactly how to take action. Dr. Cohen is a pioneer in the use of biodegradable devices in craniomaxilloficial surgeries, and together these surgeons help hundreds of infants and children just like Avery recover more quickly and easily each year. In addition to craniosynostosis, Avery still battled SVT, where they caught episodes at four months and two years of age. Now, she is on two different medications (propranolol and fecainide), which seem to be controlling her heart but she may need an additional surgery at age five to fix it. If you ever met Avery you would never know the difficult journey she has faced. Today she is a healthy, happy toddler who adores her big brother and has dimples that could melt your heart.